The center was founded in 1990 through the generous bequest of Colorado Law alumnus, Ira C. Rothgerber. Professor Suzette Malveaux joined the White Center as its director in fall 2018. Colorado Law Constitution Day Project: This project launched in September 2011 and enables Colorado Law students and professors, along with area lawyers, to visit high school classrooms in honor of Constitution Day. If you are a law student or attorney interested in volunteering for Constitution day, click here. If you are a teacher who would like a Constitution Day presenter, click here. Marshall-Brennan Constitutional Literacy Project: Through the Marshall-Brennan Project, upper-level Colorado Law students partner with public school teachers in underserved high schools to teach a course about the Constitution and the Bill of Rights. The project exposes high school students to higher education opportunities and encourages them to participate in a moot court competition hosted at Colorado Law each spring. John Paul Stevens Lecture: The Stevens Lecture brings a well-known jurist to Colorado Law each year and is open to the public. The inaugural lecture was delivered in 2011 by former U.S. Supreme Court Justice John Paul Stevens. Justice Ruth Bader Ginsburg gave the 2012 lecture, and former Justice Sandra Day O’Connor visited in 2013. Justice Antonin Scalia delivered the fourth Stevens Lecture on October 1, 2014, where he discussed constitutional interpretation. Justice Sonia Sotomayor visited Boulder for the 5th Annual John Paul Stevens Lecture on Friday, September 2, 2016. Ira C. Rothgerber Jr. Conference: Each year, the Rothgerber Conference brings scholars to Colorado for a discussion of timely questions of constitutional significance. The 26th Annual Rothgerber Constitution Law Conference, “Listeners and the First Amendment,” took place Friday, April 13, 2018. 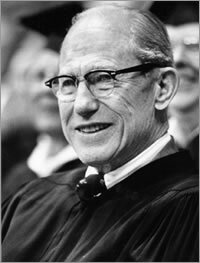 Former United States Supreme Court Justice Byron R. White was born in Wellington, Colorado in 1918. After graduating at the top of his high school class, Byron White chose to attend the University of Colorado at Boulder, graduating in 1938 as the student body president, class valedictorian and an extraordinary athlete. White was named to the All-American football team his senior year. 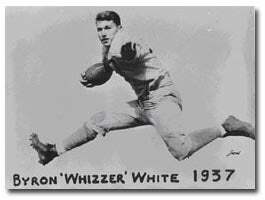 The nickname “Whizzer,” bestowed upon him by reporters covering his illustrious CU football days, would follow him throughout the rest of his public life, much to his dismay. White graduated from CU Boulder with two amazing opportunities: he was awarded a Rhodes Scholarship and was offered the highest contract price ever to a college student to play professional football in the NFL. He managed to do both, deferring his Rhodes Scholarship for a year to play for the Pittsburgh Pirates and then heading to Oxford, England in 1939 as a Rhodes Scholar. He returned from England slightly early when World War II erupted and began studying at Yale Law School, also taking courses at Colorado Law. While studying, he managed to squeeze in two more seasons of professional football, this time as a running back for the Detroit Lions. In 1941, White left behind both law school and football to join the Naval reserves. As an intelligence officer stationed in the Pacific Theater, he received two bronze stars during his military career. He returned to Yale after three years of military service and completed his law degree in 1945. White clerked for Supreme Court Justice Vinson for the term starting in the fall of 1946 and moved back to Colorado in 1947 with his wife, Marion Lloyd Stearns. He started his law practice with a firm called Newton, Davis & Henry (known today as Davis, Graham and Stubbs). In 1960, White took an active role in John F. Kennedy’s bid for the presidency. Following Kennedy’s election, White became a Deputy Attorney General and less than a year later, in 1962, White was appointed the ninety-third justice of the Supreme Court. Over the thirty-one years that Justice White served on the Supreme Court, some of the most pivotal cases of our times were heard with Justice White writing over nine hundred opinions. In the areas of criminal law, free press, and substantive due process, to name a few, Justice White left a lasting mark. Upon his retirement from the Supreme Court in 1993 he maintained an office and heard cases in both Washington D.C. and by designation on the Tenth Circuit. White passed away in 2002 at the age of 84. Each year Director Hart selects Research Fellows to help her implement the Center's mission. Research Fellows are chosen based on their demonstrated excellence in constitutional law and their commitment to public service.